From December 4 to 6, the first edition of Delhi Comic Arts Festival (DeCAF) brought together artists, professionals and enthusiasts from around the world, for an eclectic range of exhibitions, presentations, performances and panel discussions on various subjects, to showcase art of comics differently and to explore trends in comics, cartoons and illustration. India International Centre (IIC) in New Delhi, hosted the first chapter of an international festival dedicated to illustrations and comics. 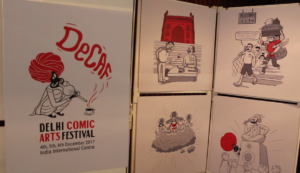 The Delhi Comic Arts Festival (DeCAF) honoured the independent international scene of comics, cartoons and illustration in various ways by showcasing and exploring this art differently and in all its forms. Anindya Roy, founding director of the festival, is a man who has many artistic pursuits – filmmaking, publishing (with the founding of Phantomville, the first publishing house for comic books and graphic novels in India), creating comic books on social issues for NGOs, among others, and has been awarded residencies, writing and research grants by organisations such as British Council and Alliance Française. He told Media India Group that, with this festival, he wanted “to create a certain following, to create a culture roundup, so that people are able to connect with indie comics”. He added that he desires to create another interesting component of exhibition, which goes beyond all conventional forms of exhibition to present this art in all its aspects to the public and to showcase “what all comics are capable of doing”, because, “something has to change, the curiosity among graphic novel and comics creators is huge” and “many more creators are on the scene” now. Always in search of innovative ideas, Anindya Roy wants “the artists to think out of the box”. A platform for discussion and dialogue amongst artists and players in this sector, the festival also held round table conferences and hosted the launch of the book ‘The Elephant in the room’ – a feminist Indo-German graphic anthology published by Zubaan, highlighting the importance of the new female guard. Pointing out the ability of comics to raise difficult issues through its appearance of being light and breezy without raising any censorship alarm, the eclectic range of topics covered (of both style and content) ranges from mythology to autism, including the role of comics in society, in movies, animation and video games, amongst others. According to the organiser and participants, owing to lack of exposure, comics are still in its nascent stage in India, but it is growing and buzzing with creativity and ideas. This festival marks a turning point, as noted by Appupen, an artist who has notably published graphic novels describing a mythological world called “Halahala” with a sarcastic bite. He remarks: “This is the first time we are getting a place where comic’s artists can really talk about their work on a platform like this in India.” He sees this event as “another voice”, as a response from the independent scene to the mainstream one and the Comic Con. Like this artist, many others participants were thrilled by the DeCAF and were calling for the sustainability of the initiative. See you next year with Anindya Roy and the Delhi Comic Arts Festival!